What a beautiful card - no doubt you were glad to hear when it finally arrived! I have had cards returned due to lack of stamps! Gorgeous card Sharon, beautiful stitching and image. Your stitching is beautiful, Sharon and the colours are perfect with the central image, such lovely rich colours. Stunning card,Sharon.Wonderful stitching and a beautiful image.Enjoy your week. 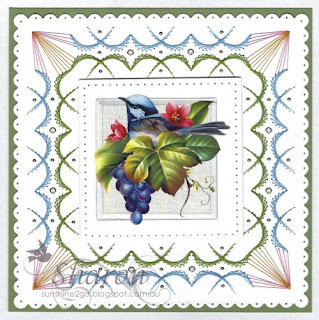 This is gorgeous Sharon, such a beautiful image and fabulous stitched border - very intricate. Just popping by to say hello.Enjoy your week :).